To register for your login details, please fill out the form below and we will be in contact to provide you access. This service is for members only. If you would like to apply for membership, please visit the membership page. This month we’re focusing on preparing the grounds for spring, planting new climbers and carrying out some essential pruning in our much-loved gardens. In February everything starts to come alive, with winter flowering shrubs adding colour and scent around the pathways and countless Hamamelis, Viburnum and Sarcococca springing into life. Visitors may even be lucky enough to see a peppering of snowdrops, having been planted around the gardens over the last few years. Emblematic of spring, these delights are often the first sign of warmer weather ahead. In addition to this, hellebores and winter aconites will be putting on a show under the glowing stems of dogwoods and willows. Evidently, the winter border will be looking at its best, with a variety of flowers and plants brightening it up and welcoming spring to the gardens. The Alpine house will soon be full of colour too, with many potted bulbs starting to burst through and blooming in bright colours. Crocus, Iris and snowdrops will provide a backdrop for a number of Cyclamen that will be blossoming soon. 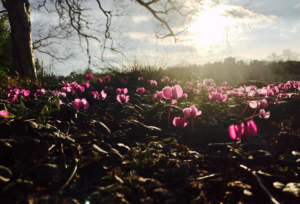 On the subject of Cyclamen, the Cyclamen society will be having its winter show at the gardens on Sunday 4th February; you can find more information here. Moving through the gardens, you’ll be able to see that a number of hedges are still being cut and pruned. After a number of years, some of our hedges become large and wild – by reducing their height it allows them to be maintained much more easily. This is not the ideal time of year to be cutting hedges this drastically, but the outside team can spare the time to carry out large tasks like this in winter months. We are also working on repairing worn grass areas after parts were slightly damaged after the Christmas lighting event. Hopefully, if the weather will allow and we do not get too much rain or snow, we can use fresh topsoil to level the ground in preparation for over seeding and, in some areas, laying new turf. To prevent weed growth we will also be adding our own homebrewed compost, also helping to conserve water and prevent the ground drying out in the summer months. In the glasshouses, the team will be busy improving the interpretation labels on the educational plants in the Subtropical House. The labels are a great way of teaching visitors about the importance of plants, using fun and interesting facts. Most of our plants are used in the production of many household and commonly used items such as tea, bamboo and cotton. Moreover, the Mediterranean House will have an extra four different coloured Bougainvillea vines planted in it, creating a rainbow of colour. In addition to the Bougainvillea ‘San Diego Red’, there will be B. ‘Alexandra’ (purple), B. ‘Orange King’, B. ‘Golden Tango’ (golden-yellow) and B. ‘White Cascade’. Although not currently at their best, they will be big, bright and bold come April time. If you enjoy visiting the gardens, why not become a member today. Members make a vital contribution to the gardens and their support means that our staff can continue their work and keep the gardens growing for years to come. 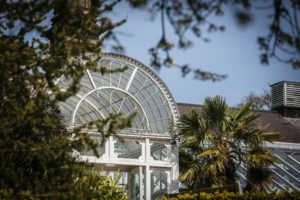 Not only will you receive free unlimited entry to The Birmingham Botanical Gardens, you also gain free entry to many other celebrated gardens across the UK. Please visit our Membership page to find out more.